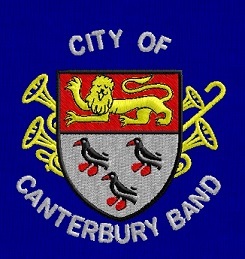 Historically, there was a Canterbury Silver Band which was disbanded in the War years. The present Brass Band was formed in 1969 and some of the original members still play with the band now. The members of the band come from all walks of life and are of a great range in ages. Many of the players travel great distances to rehearsals. The band prides itself in being a most welcoming, friendly and dedicated organisation that provides entertaining music for its listeners. The players enjoy performing on a very regular basis in the South East. The band has wound thirty engagements this year, which include formal concerts, playing at bandstands, performing at fetes, providing music for church services and supporting local charities. The band has also recently produced a CD joint with a local choir and is presently looking into producing another recording of its own music. If you are interested in playing with a brass band, why not go along to one of the band's rehearsals? At present the Band has its bandroom just outside Canterbury, at Chartham Hatch village hall and rehearsals we held every Friday evening between 8.00 pm and 10.00 pm. Any player, of any standard, will immediately be made to feel most welcome.